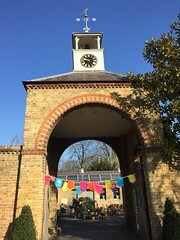 Merton Arts Space has celebrated a successful first year attracting praise from audiences and performers impressed by its unique setting in Wimbledon Library. The space was developed after the library service, successfully won Arts Council funding for the project in 2016 and has since collaborated with more than 60 local arts and community organisations to provide an eclectic programme of activities and events over the past year. The space, which can accommodate up to 300 people, is used as a reference library during opening hours and can be quickly converted to accommodate a stage, lighting and sound rigs and 250 seats. Stand-out events included a talk by author Jessie Burton, a two week theatre run of Great Expectations, a Club Soda cabaret evening and a sell-out gig by Jah Wobble and the Invaders of the Heart.